Ann Craig - distINKtive STAMPING designs - Stampin' Up!® Australia: Collage Stamping Made Easy With Stampin' Up! 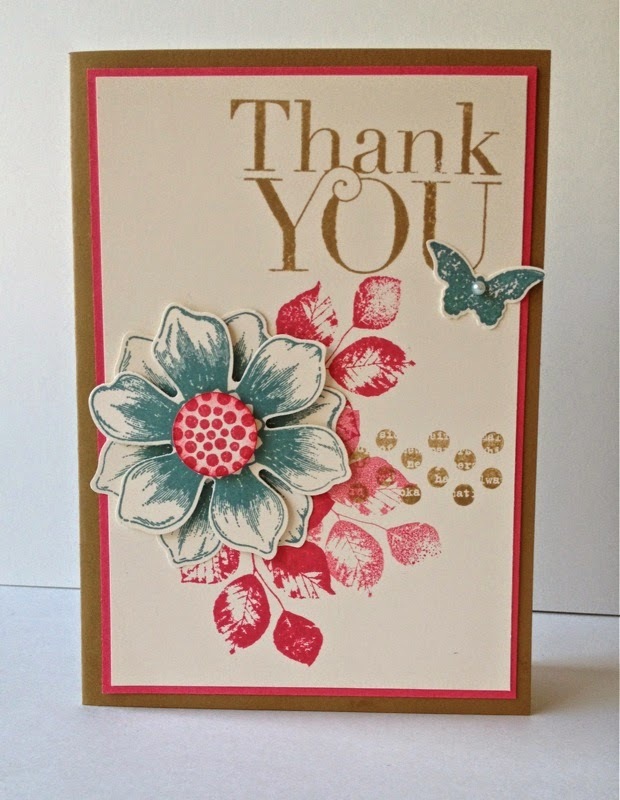 Collage Stamping Made Easy With Stampin' Up! Collage Stamping is so much fun and Stampin' Up! have made it an easy task with some of the new release stamps in the new Annual Catalogue. You should check out pages 164 - 165 as these pages contain the 3 stamp sets that combine beautifully together to create exciting cards. "A piece of art made by sticking various different materials such as photographs & pieces of paper onto a backing." But it can also mean: "a collection or combination of various things", so I think by combining a number of different stamp sets that we are making a collage. Also the concept of stamping over the top of other images relates to the collage concept. Kinda Eclectic, Work of Art and Gorgeous Grunge are just perfect for this style, and recently I made some cards using different colours and different layouts to demonstrate just how versatile these sets can be. 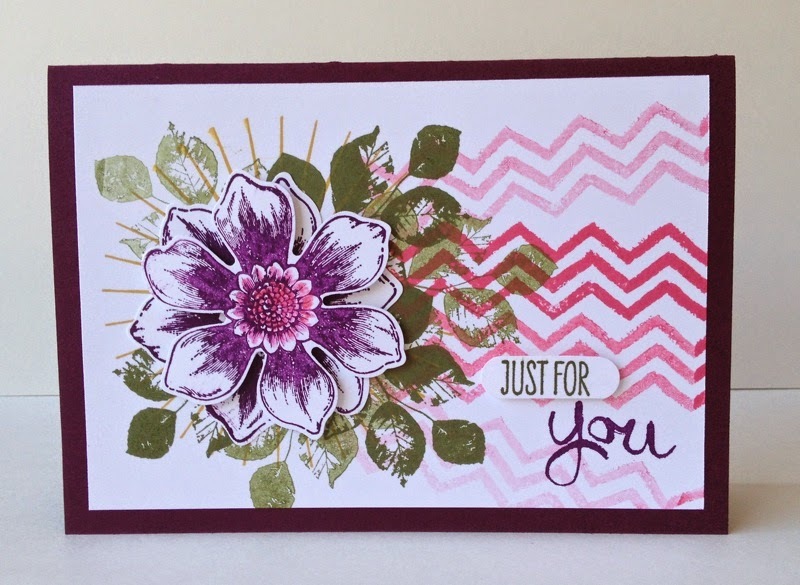 I used the Beautiful Bunch Stamp set (page 158 AC) as the focal point for my cards, and employed the method of stamping off to obtain the variety of tones in the colours. Are you loving the purple of the flower? 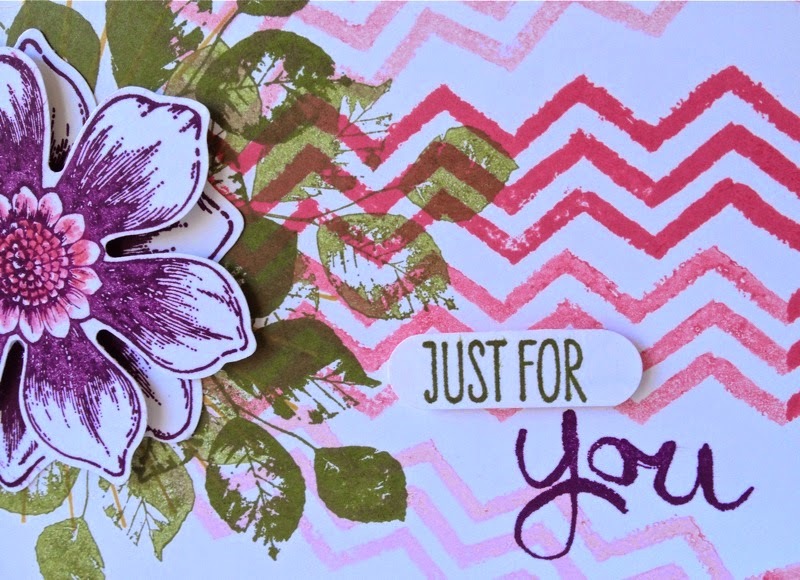 it is one of Stampin' Up's new In Colors for 2014 -2016 and is named Blackberry Bliss. I think this will be a favourite of many people. And here is another card using the same sets but different colours. Quite a different look! These colours are Baked Brown Sugar: Lost Lagoon: Strawberry Slush, stamped onto Very Vanilla Card. The items will be sent directly to you and you will have me as a contact to assist you with after sales service. Thank you for your kind words Dianne. I love my papercraft and enjoy sharing with people around the world.